'Warner Bros. Animation' have recently released their sequel to "The Death of Superman". It's 87 minutes long, it's directed by Sam Liu, and it features the vocal talents of the following actors: Jerry O'Connell, Rebecca Romijn, Rainn Wilson, Patrick Fabian, Charles Halford, Cameron Monaghan, and Cress Williams. Please enjoy. As I look way up, up, up, into the sky, I see a bird, I see a plane, and I see four different versions of Superman beating the living daylights out of each other. Admittedly, none of them are the real deal because our beloved Man of Steel died six months ago while battling Doomsday. But still, there they are, punching and kicking and slapping each other with a bam-biff-pow, while I’m standing here, next to Lex Luthor (Rainn Wilson), trying to figure out who they really are. 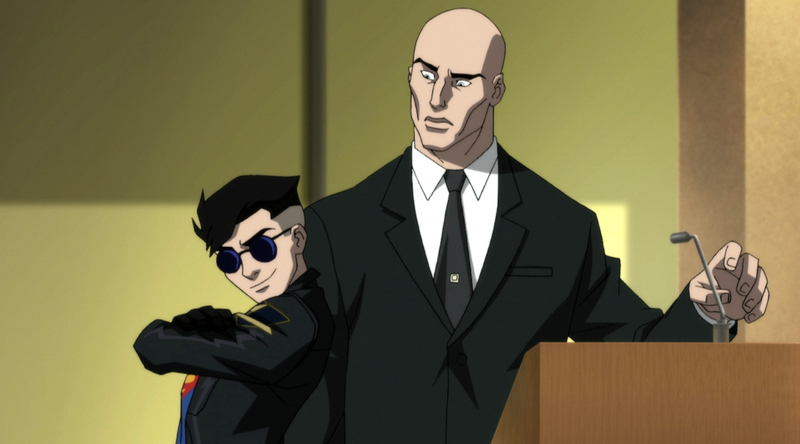 Now, after some meticulous investigation on behalf of the Daily Planet, I, Lois Lane (Rebecca Romijn), highly suspect that 'Superboy' (Cameron Monaghan) is a clone of the original, while 'Steel' is a scientist called John Henry Irons (Cress Williams). As for those other two, on the other hand, at a guess, 'The Eradicator' (Charles Halford) is most probably connected to the planet Krypton, whereas 'The Cyborg' (Jerry O'Connell) is somehow connected to the alien invasion which caused the destruction of the Justice League. 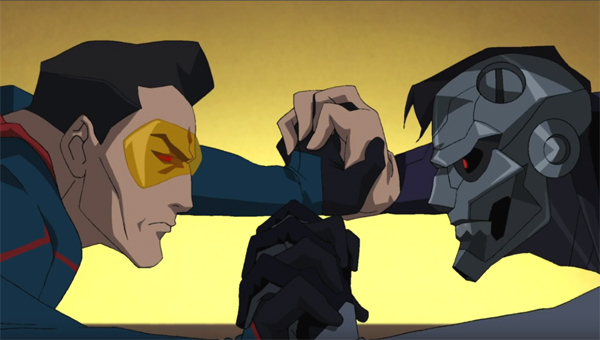 But then again, that’s most probably why what next transpires goes from bad to worse when Darkseid shows his face. As a planet finds it hard to mourn - a civilization gets slowly torn - an evil villain shows his scorn - and at the end of the day, praise the Lord, a hero is reborn. In January, 1993, DC Comics decided to kill off one of their oldest and most iconic characters. No, not Batman, silly, but rather, Superman: The Last Son Of Krypton, and even though this 'major event' played out in a fairly spectacular fashion (as it hit the headlines all across the world), most of us regular comic book fans knew that it was nothing more than a stunt to drum up some additional business. Well, for those of you not in the know, during this era (the post John Byrne era) the four Superman titles which were then in publication, couldn’t keep up with the Batman books or the X-Men titles released by Marvel. So, according to Mike Carlin (the Superman group editor), both he and his team got together and planned a ‘grand event’ that would boost ratings and draw some attention towards their range of books. Which it did, big time: First with the aforementioned "Death of Superman" storyline, then with its aftermath, "Funeral for a Friend", and finally, to make it into a trilogy, there was the ‘Reign of the Supermen’ saga, which this animated adventure was partly based on. Now, on a side note, you might like to know that ‘Reign’ was published on a weekly schedule between June and October, 1993, and was written and illustrated by the regular members of the Superman creative team. This included Roger Stern and Jackson Guice (for ‘Action Comics’); Karl Kesel and Tom Grummett (for ‘The Adventures of Superman’); Louise Simonson and Jon Bogdanove (for ‘Superman: The Man of Steel’); and Dan Jurgens and Brett Breeding (for the main ‘Superman’ book). All of which brings me quite nicely onto my opinions for this film. Well, to be fair, I thought that it was a fairly good film, in part, and I did enjoy it a lot more than I thought I would. After all, it was fun, it was focused, and it did its best to stay true to the original source material. Not always, mind you, because it also took some liberties in terms of condensing and removing previously established plot-points, namely, the destruction of Coast City, the annihilation of the 90's League, Ma and Pa Kent’s contributions, Warworld, Green Lantern Hal Jordan, Project Cadmus, The Guardian, plus much much more. Having said that, though, as an animated adaptation in its own right, it did manage to maintain a semblance of the original epic by channeling the overall narrative through one specific character: Lois Lane, and her quest to find out who the real Superman actually is! 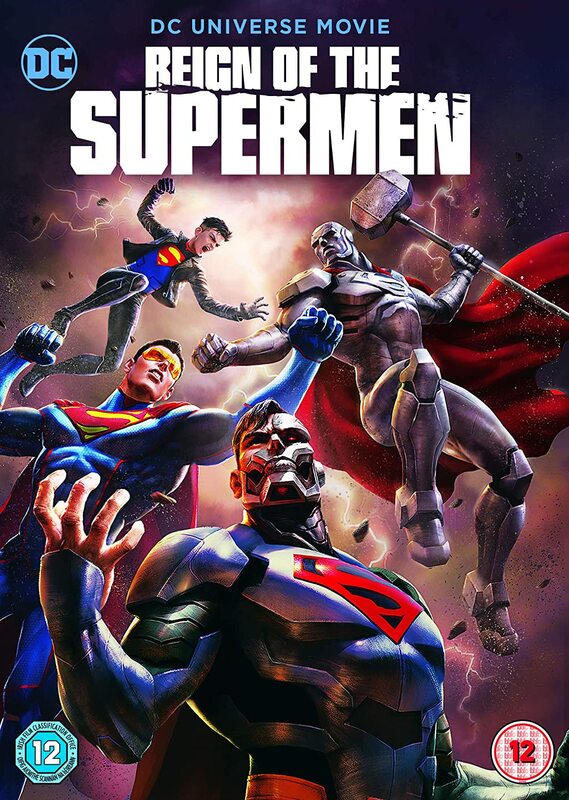 Basically, this was more of a science-fiction based detective story than a grand and elaborate multipart odyssey focused on four new versions of Superman: Which included, Steel (The honourable man of science); Superboy (The conflicted kid from LexCorp); The Eradicator (The sterile sycophant); and The Cyborg-Superman (The mysterious interloper with a dubious past). Four men who displayed certain attributes commonly associated with The Man Of Steel, both positive and negative, but clearly couldn't be him because of who they are inside. Along similar lines, I would also like to mention how certain characters were replaced or altered in order to facilitate for this current adaptation. This was particularly apparent with the inclusion of Darkseid and the modern-day version of the Justice League, with the former being a replacement for the tyrannical ruler of Warworld, Mongul, while the latter was an updated version of the 90's League, comprising such members as Booster Gold, Blue Beetle, Maxima, Guy Gardner, Fire, Ice, Bloodwynd, and of course, Superman himself. Collectively, I'd say both of these alterations were a nice little touch -- thematically, at least -- but unfortunately felt too fleeting and superficial to make much of an emotional impact on the overall plot. So much so, in fact, that the two of them occasionally seemed to have been pushed to one side for the sake of cinematic reinterpretation! Anyway, that’s enough of that for the time being, as now would be a pretty good time for us to sit back, relax, and check out the following filmic facts: (1) 'Warner Bros. Animation' first released this production on the exact same day they celebrated 'National Rubber Ducky Day' on 'Sesame Street'. It was on the 13th of January, 2019. (2) One of the taglines used to promote this picture, states: 'Nothing ever truly dies'. (3) Loosely translated, this project was entitled 'Superman's Reign' in Russia, and 'Superman Superman' in Turkey. (4) Rebecca Romijn and Jerry O'Connell are married in real life and provide the voices for Lois and Clark in this film: Two characters who eventually get married in the comic books. (5) If you look very closely at that newspaper-styled montage sequence, you might be able to notice the cover for Action Comics #690, circa August, 1993, featuring The Eradicator! (6) The last sequence in this film was a direct homage to Christopher Reeve's iconic flying sequence from the 1978 classic, 'Superman the Movie'. (7) Brenda Strong, who voices Lillian Luther in this adventure, also plays the same character on the CW's "Supergirl" show; whereas Cress Williams, who voices Steel in this adventure, also portrays Black Lightning in his CW television show. Both characters are from DC Comics. (8) After this flick went, up, up, and away, Jerry O'Connell starred in the comedy, 'Ballbuster'; Rebecca Romijn starred in the horror-parody, 'Satanic Panic'; and Rainn Wilson starred in the nautical adventure, 'The Meg'. Out of curiosity, did you know that the name of this storyline was partly inspired by the first Superman adventure ever created by Jerry Siegel and Joe Shuster? It was called, ‘The Reign of the Superman’ -- man, not men -- and it was published in January, 1933, inside the fanzine, ‘Science Fiction: The Advance Guard of Future Civilization’, issue 3. Now the main reason why I bring this point up; is because this film, just like this fanzine, was able to show us a different interpretation of something we thought we already knew. Firstly, through a story that was distilled and streamlined so the ‘end product’ could be a lot more refined than the original source material. Secondly, through the vocal talents of the numerous actors hired, such as Jerry, Rebecca, Rainn, Patrick, Charles, Cameron, and Cress, who were able to refine their performances by giving us something familiar yet new at the same time. And thirdly, through the actual animation itself, which had to be refined in order to ignore the numerous and varied styles depicted in the comics. 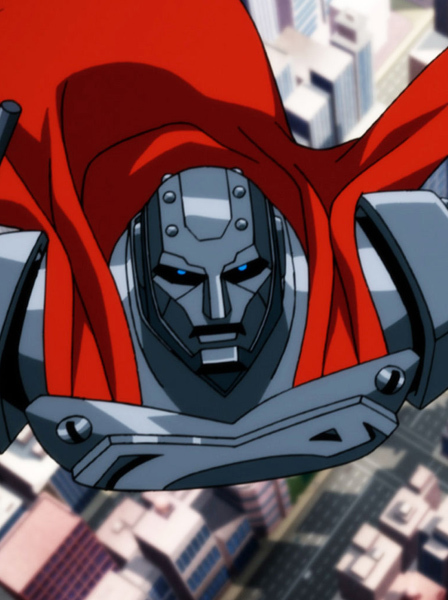 Refined, being the operative word here, folks, which in many ways sums up my feelings for the 'Reign Of The Supermen'. It was a refined film, more or less, which was concise in places, charming in others, and tried to respect the original in tone if not in stature. REIGN OF THE SUPERMEN is available on Digital Download, Blu-ray™, and DVD from the 28th of January, 2019.